A SENIOR GARDA has warned that new members of the Roads Policing Units across the country will be moved if they do not increase the number of fixed charge notices they issue. In correspondence sent by Assistant Commissioner of Roads Policing and Major Event Management, David Sheahan, to Chief Superintendent Roads Policing in the Dublin Metropolitan Region (DMR), Aidan Reid, details are provided of a “review of the contribution to road safety” of new members of these units. Sheahan, in his letter, names 16 gardaí appointed to Dublin units and criticises some for failing to hand out enough fixed charge notices [which are for drink-driving, dangerous driving, lack of tax or insurance etc] to motorists. The correspondence suggests garda management has moved to a focus on statistics – a criticism leveled at senior officers by rank-and-file members after the breath test scandal emerged. In total 87 new members were allocated to roads policing units from 1 May this year. The assistant commissioner conducted a review of individual member contributions over May and June of this year and in his letter, he claims the outcome “in some instances, falls below the standard I would expect of newly appointed members who were successful in a competition that they themselves applied for”. His correspondence, seen by TheJournal.ie, contains a number of tables, including one showing detections for what are known as ‘lifesaver offences’, which include driving while using a mobile phone, speeding and driving without a seatbelt. The average number of detections per garda over these two months was 38, which Sheahan said was “below the standard that should be expected”. He said it is also clear that 52% of all new members made a contribution of less than the average. The Assistant Commissioner then goes on to reveal details of his review of each of the 16 individual members of the roads policing units in the DMR region, which Chief Superintendent Reid is in charge of. He notes that one garda, who he names in his letter, “has made a positive contribution to the detection of lifesaver offences”, having issued 122 fixed charge notices over the two month period. However he points out that ten members in this region fall below the average and two “made no contribution at all”. He also included a table with each garda’s name and the number of FCNs they issued in May and June this year. He warns that regional commanders and divisional officers “need to address the lack of contribution from a significant cohort of roads policing personnel” and that members should be “under no illusion that such contribution will lead to their removal from the roads policing unit. Speaking to TheJournal.ie, one member of a roads policing unit said management is “going down a dangerous road” if it is judging performance based purely on these statistics. They pointed out that the issuing of fines is just one part of the job these units do. Other duties include traffic management – both day-to-day and for large-scale events like the pope’s visit – high viability patrols and checkpoints, school talks, multi agency operations (with the RSA for example), court appearances and stop and search operations. As well as that, members of roads policing units are constantly being taken off their normal duties to attend to calls that would normally be dealt with by regular units. If there is a call to a domestic violence disturbance or a public order incident, the closest unit will go. None of this is accounted for in what the assistant commissioner is saying. “People are out every day preventing fatalities and on many occasions you can’t put numbers on that,” they explained. “Take the mandatory intoxicant checkpoints that we are doing every single day – you could have two or three guards testing 100 people and they may not issue any notices. But it’s about visibility, and sometimes the interaction with the public, passing on advice and education. The Garda Press Office told TheJournal.ie that it is not the policy of An Garda Síochána to comment on internal correspondence. However, it went on to add that the roads operation plan for this year is designed “to address the challenging objectives” laid out in the government’s road strategy to decrease fatalities to less than 124 per year and serious injuries to less than 330 per year by 2020. The use of mobile phones while driving. “While it is the role of all Gardaí to enforce Road traffic legislation, it is the primary role of members assigned to Roads Policing to enforce this legislation. Garda management across all units in the organisation constantly review, assess and manage resources to ensure policing plans are executed with maximum efficiency and will liaise with the various member to ensure the highest standards are achieved and surpassed where possible. Email “Senior traffic garda singles out gardaí he believes aren't issuing enough fines ”. 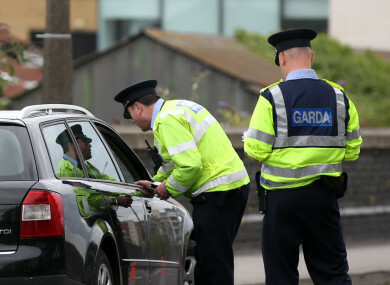 Feedback on “Senior traffic garda singles out gardaí he believes aren't issuing enough fines ”.